I am pleased that you have been able to join me in welcoming to Samoa the President of the Asian Development Bank Mr. Takehiko Nakao and his delegation for a short and first visit to Samoa. I have been given to understand that in his second term as the ninth president of the Asian Development Bank, Mr. Nakao is focused on not only more assistance for the Pacific subregion, but also expanding the presence of the Bank in eleven Pacific island countries, in order to enhance the impact of its growing program of assistance. The expansion for Samoa means the conversion of the extended mission to a country office. As a founding member of the Bank, Samoa welcomes this development and to this end, the country host agreement was signed with President Nakao this morning. As well, the expansion of the Bank’s presence means that there will be enhanced responsiveness to the development needs of the subregion such as addressing the challenges of climate change and building resilience. We know that the Bank’s assistance to the Pacific has doubled every five years since 2005. Since 1966, Samoa has received financial assistance through loans and grants for the implementation of development initiatives in the sectors of education, water and sanitation, power and sustainable energy, connectivity and telecommunications, agribusiness and private sector development as well as transport. Total commitments by the Bank through loans, grants and technical assistance have reached a total amount of US$355 million. The Bank in collaboration with other development partners also extend budget support to Samoa based on compliance with a Joint Polcy Matrix as well as support for public finance management reforms. Over the course of your short visit, you will have the opportunity to see some of the initiatives for which we have requested the Bank’s support including the commissioning of the Tafitoala hydro scheme and agribusiness development. I understand you were able to view immediately after your arrival yesterday a solar power plant close to the airport. The Tui Samoa submarine cable that the Bank had co-financed with the World Bank and the Government of Australia has ensured that we have access to quality and affordable internet services. We look forward to Fiji hosting the 2019 annual meeting of the Bank in May - it is another great opportunity to bring the Bank closer to the Pacific and for the Pacific small islands states to learn more about the services of the Bank. In this regard, I wish to express our appreciation of the professional rotational arrangements, which has encouraged the attachment of senior officials from the sub-region including Samoa to the various constituency offices at the Bank headquarters in Manila. Climate change presents the single greatest threat to the livelihood, security and wellbeing of Pacific people. Pacific Leaders have committed to the importance of immediate urgent action to combat climate change through upscaling ambition with regard to nationally determined contributions. The direction of action for Samoa has been to promote nationwide reforestation and tree planting programs as well as ways to reduce emissions in the transport sector. We are experiencing more severe and more frequent cyclones, unprecedented flooding and landslides that pose a threat to national security. And if I might add, an expanded definition of regional security is inclusive of human security and climate change. We are happy to hear of the Bank’s intentions to provide additional contributions to the Green Climate fund and Resilience facilities. 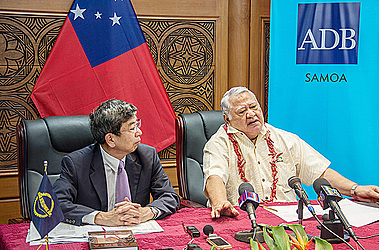 I trust Mr. President that you have through your project visits seen a glimpse of some of the developments Samoa is engaged in with the support of the Asian Development Bank. To make maximum use of the limited resources available to us, we have taken a nexus approach to implement in a prioritized and integrated manner our development needs that are aligned to the extent possible to the global Sustainable Development Goals. I wish to end my remarks by paying tribute to the Bank and the unfailing support we have received over the years. May you and your delegation have a safe return and look forward to the work program for Samoa in the months ahead. Soifua.